Health Benefits Of Coconut Oil - Coconut Oil Works: An easier way to use the worlds #1 most beautifying ingredient for skin and hair. Coconut oil has been shown to make many improvements in an individual’s overall health. Clinical trials and studies are proving time after time that coconut oil can help our bodies with many things. Other parts of the world have been using it for centuries, but it is slowly arriving in the United States and other areas a well. Let’s take a look at some of the ways coconut oil can help out our overall health. 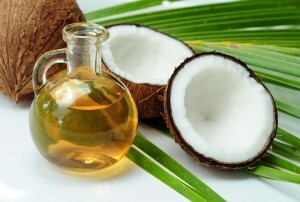 The chains of fatty acids contained in coconut oil have natural antibacterial qualities. They work together to fight off colds, flu viruses and more that are contained within your body. It has even been known to fight off bigger diseases like Hepatitis C and HIV. Coconut oil is very high in calories, which means that it take a while for your body to burn them off. When trying to control your blood sugar spikes, it is important to keep an even source of energy and nutrients. This causes your body to crave less sugar, making things stay steady. A little bit of coconut oil goes a long way because the fatty acids take longer to break down that refined sugars. Sometimes harmful toxins and chemicals get stuck in your body, making your digestive tract slow down. Coconut oil helps your body to get these toxins moving and out of your body, which makes the digestion process more effective. Again, a small amount of oil goes a long way, so it can be added to cooking recipes and even in your morning coffee in small doses. Coconut oil has been know to dissolve kidney stones, preventing unnecessary surgery. This is a great alternative for people who develop kidney stones on a regular basis. Adding coconut oil to your daily diet may be a effective way of ridding the body of kidney stones before they become a bigger problem. The natural antibacterial properties of coconut oil also transfer to oral health. Oil pulling is practiced in many western countries as a way to improve oral health and whiten teeth. A small amount of coconut oil is placed into the mouth and as it melts, you swish it, or pull it, through your teeth. This is done for about 5 to 10 minutes, getting the coconut oil all throughout the teeth. Coconut oil has been known to help with the treatment of osteoporosis. In studies of diets containing coconut oil, there was an increase in bone density and and bone volume. Adding coconut oil to your diet may be a natural way to increase bone health. These are just a few of the known benefits of adding coconut oil to your diet. By replacing some of your beauty products and some of the oils in your pantry with coconut oil, it may have lasting health benefits for you and your whole family.